Hi Til, yes by no means was I going to use the socks, they are for testing only. I still have to make the filter bags that I am planning on using. Thanks for the concern, nice to have a lot of people always watching out for each other. That’s what makes this DOW site so great! Test # 3 completed. 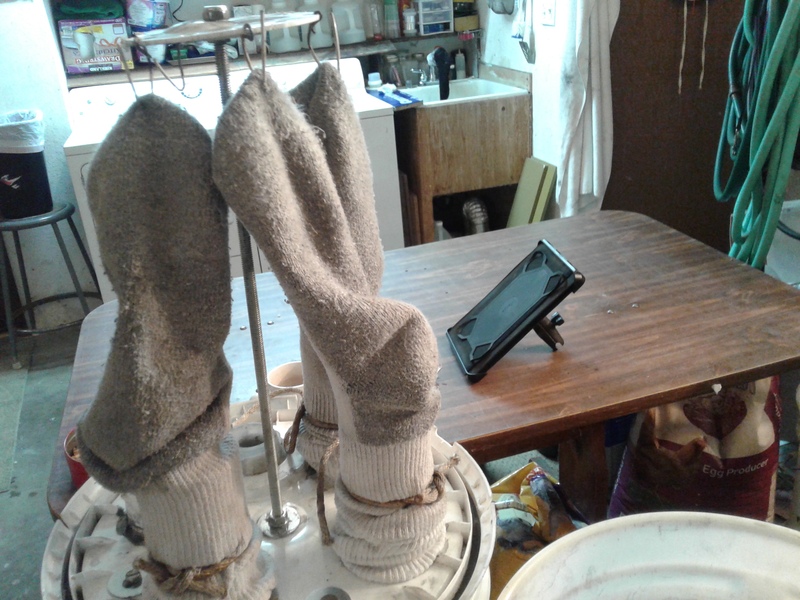 The wet test, I pulled the socks out of the wash, spin dried. Everything was cleaned up. Put the damp socks on, and put everything back together. 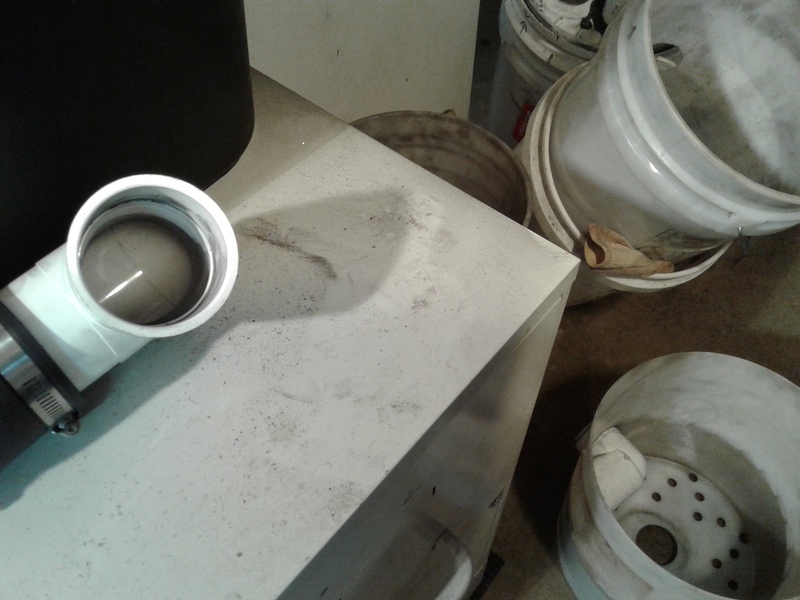 Run about a gallon of ash through the filter, but this time I put water in the bottom of the bucket like I had originally planned to trap the char and ash when it is forced down thorough the holes in the plate and then up into the black 4" pipe to the top of the bucket. 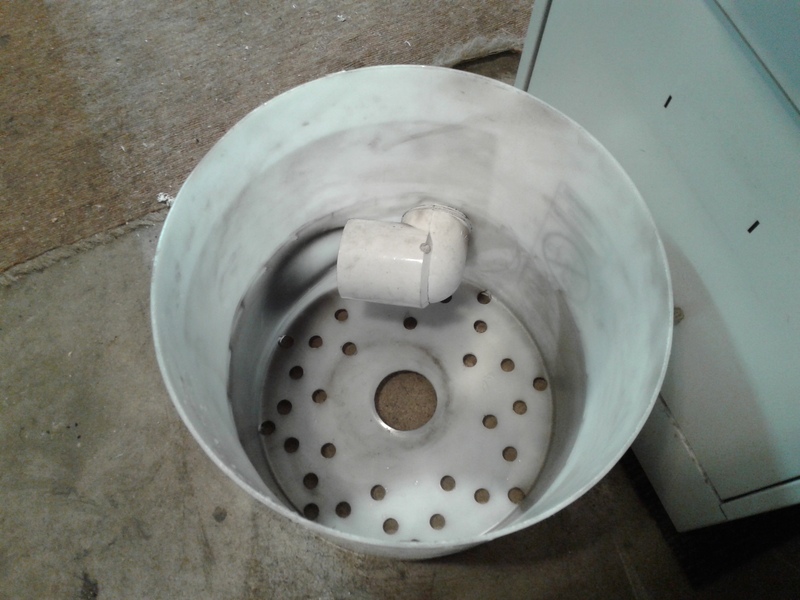 The gas will then travel down into the second trap area and then up into the nozzles with socks attached in the top container. Here’s the out come of the test. Very little in the second trap area above the clycone. 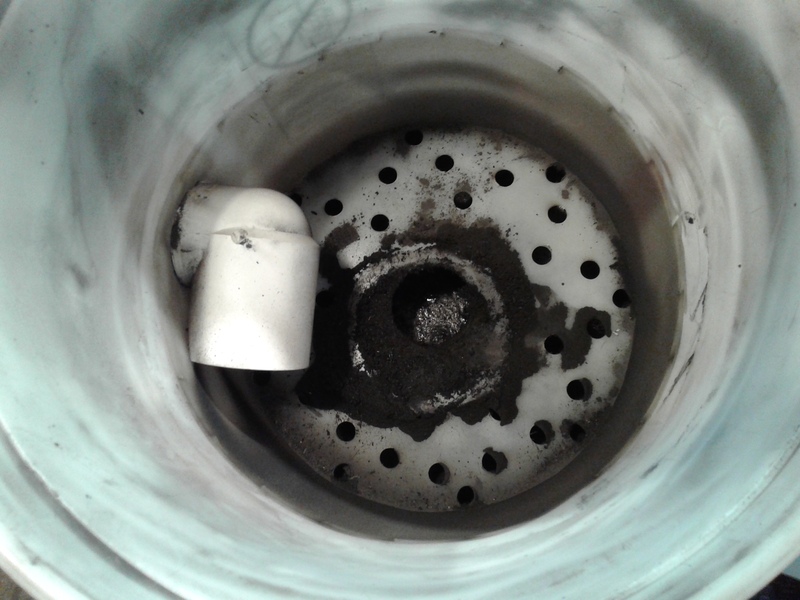 It looks like my black pipe did not seal completely at the bottom. Looks like most of the char and ash is in the water below. Some stuck on the black inside pipe and top of lid. Yup the black pipe lost It’s seal on a small part. Will fix that when the hole is cut into the plate. There was a crack in the plate that might have let char and ash through, I cut the plate to small, will make a new one. 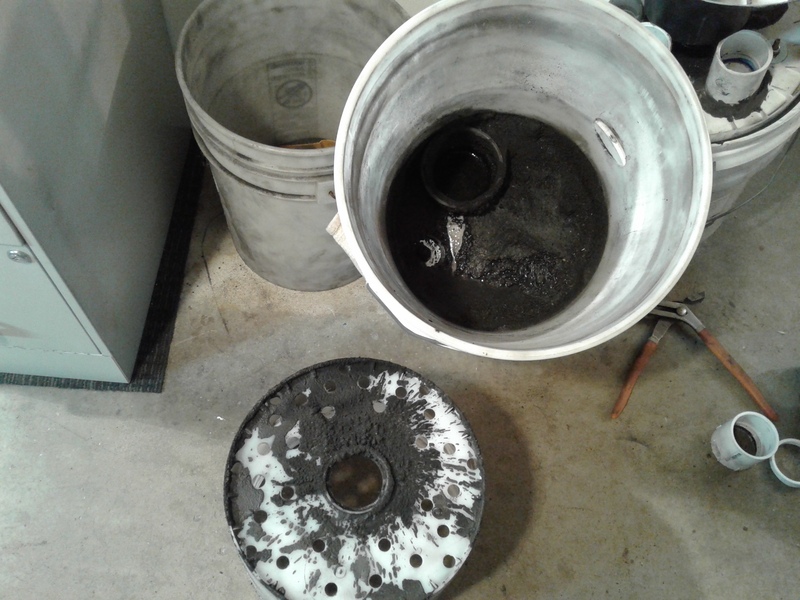 Most of the char ash is right here in the bottom of the bucket, and looking at the under side of the liner bucket plate. Very little dust in the gas outlet exit pipe. The clycone marked the buck, lighter on the back of the nozzle wall. You can see the off set of the black pipe in the bucket. Seems to be working good, forcing the gas down into the holes. 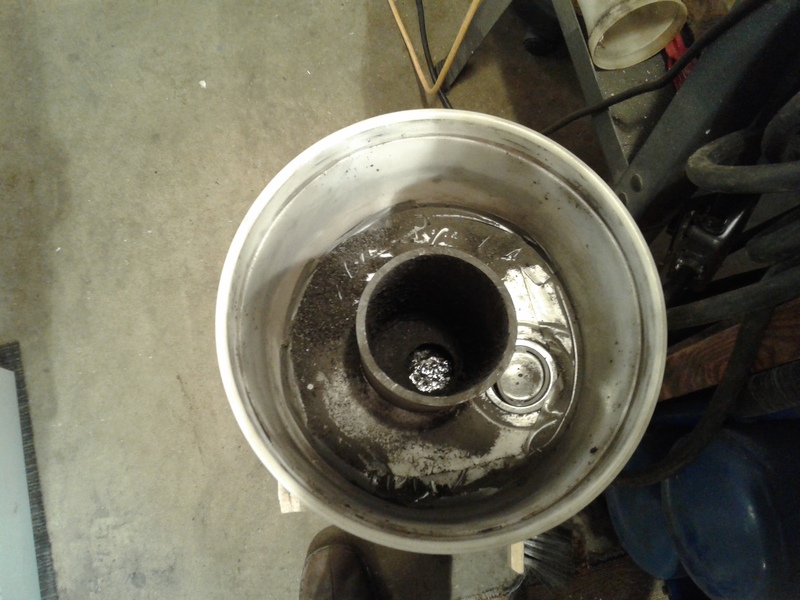 The next build will have a deeper sump for the water. 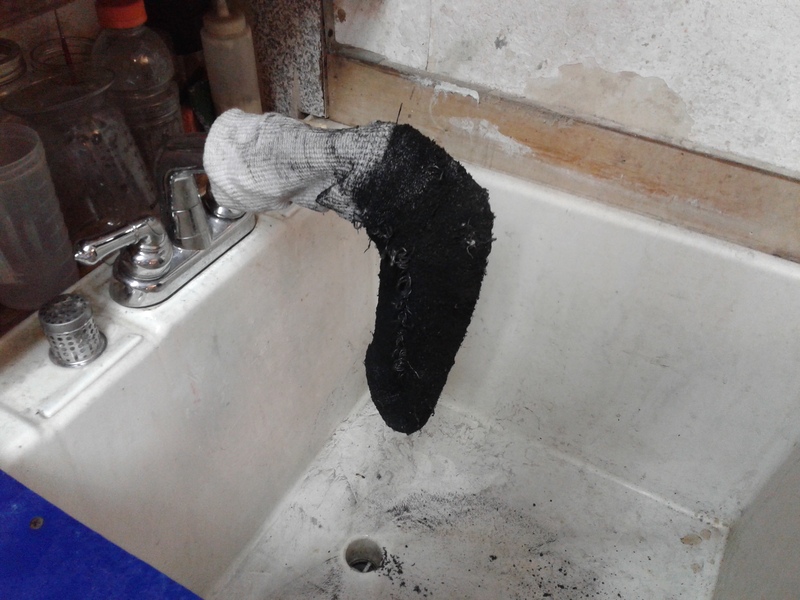 The inside of the sock had some char ash caking on them. The socks look like the way I put them on. 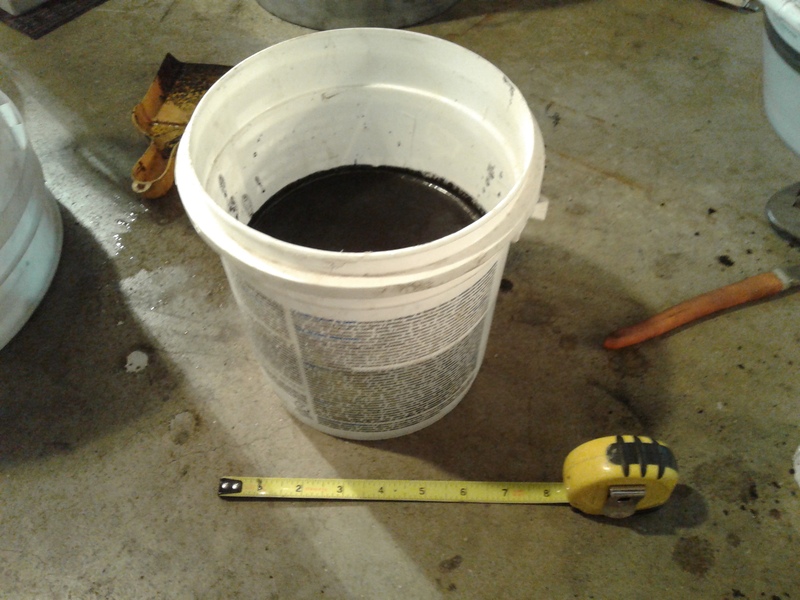 Black gold slurry from the bottom of the bucket, some went down the sink. A friend of mine sells really fine SS screen. When I get back into wood gassing, I want to try it as an option.I like Max’s suggestion and having a bunch of them. The stuff he has is more rigid than this but this will give you an idea. Great job, Bob. Seems to work well as it is well thought out. Almost everyone can use some of your ideas, I know I will. I didn’t get a lot done today on the gasifier, sent most of it shoveling snow. Got up this morning 06:00 am snowing hard at 07:00 it stop snowing I started shovel snow and finished 2 1/2 hours later. And then it happen, it started to snow even harder. I went in the house and took a break until it stopped, I went back out with the Granddaughter and played for about a hour and then shoveled it all over again. It was much harder the second time around. Boy I was beat. 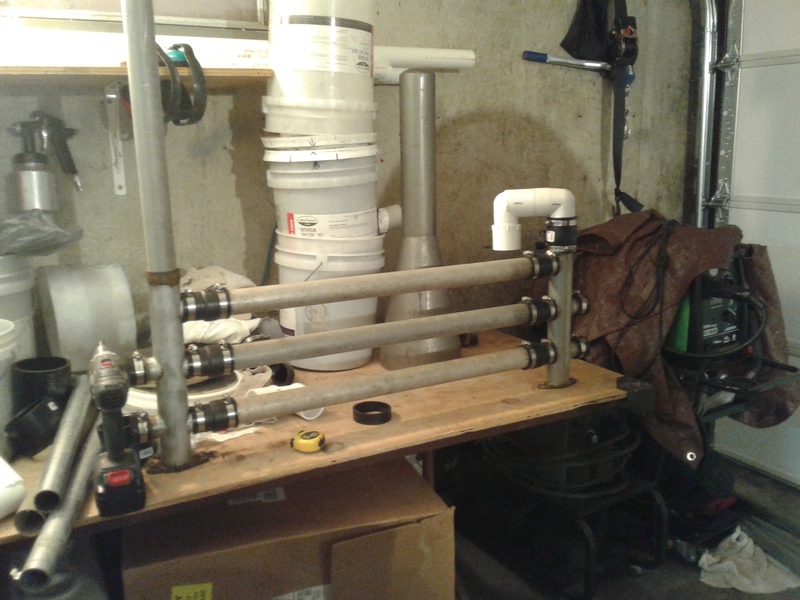 I did get the cooling rack together and started to figure how to lay the piping out. @Chris you might recognize a couple of pieces in the cooling rack. It’s Snowing and we are expecting freezing rain tomorrow morning. I’m in the warm garage put the parts together and trying to ffigure out the best place to mount the cyclone filter. Since the weather is turning into last year’s weather I might as well finish everything on this unit before doing another test run. I know, I know you want to see it flare, but It’s cold outside . You are right about that Koen. Just trying to get it all finished up before flaring it again. 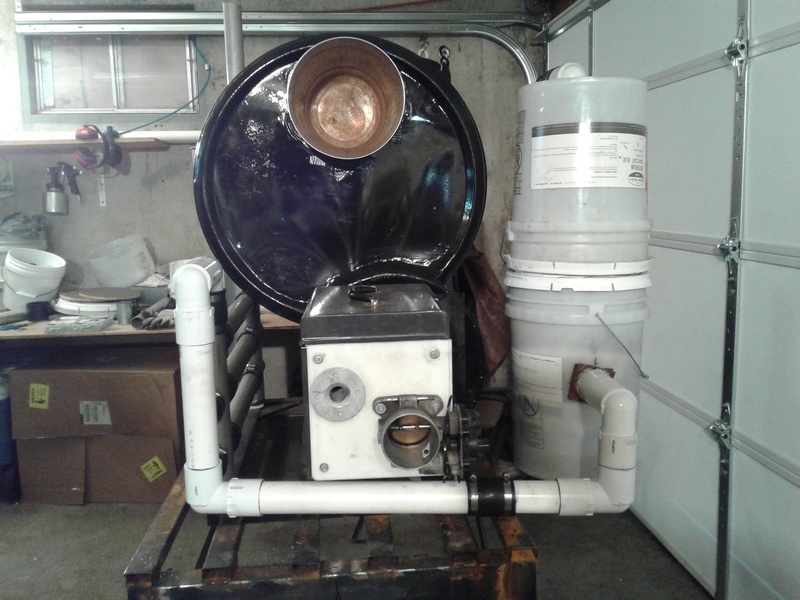 This little gasifier build has been a long drawn out project. 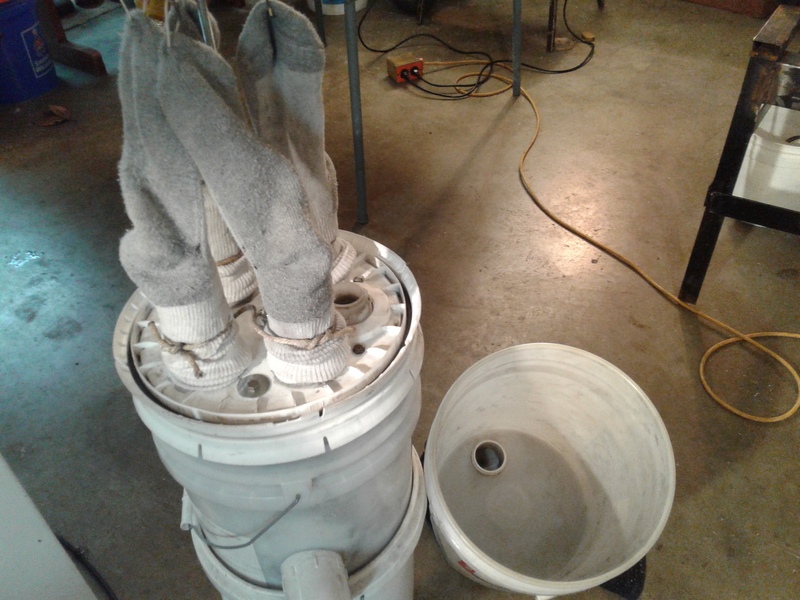 I pretty sure I have put more thinking time in about this gasifier build, than I have actually worked on it. A word of caution thugh! 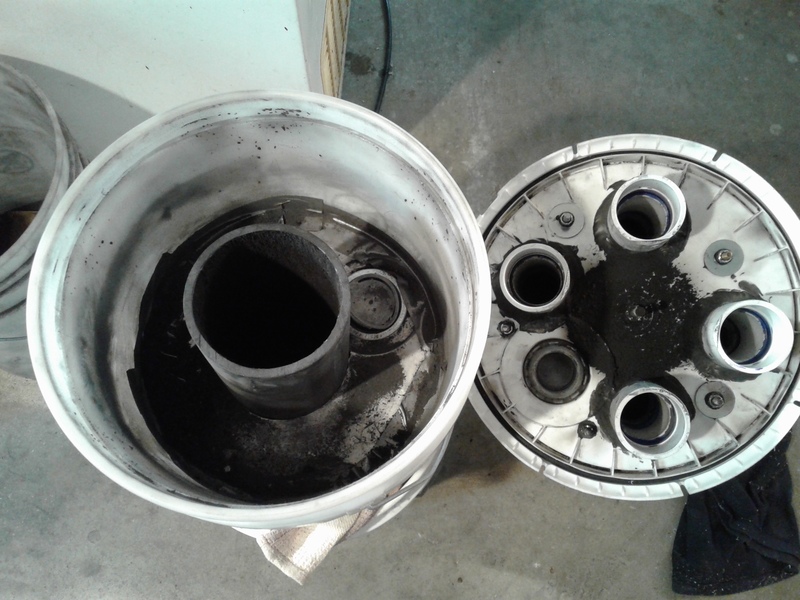 Looking at your bucket filter, l remembered l tested a bucket filter once with my char powered Seat, and it wuld vacuum colapse just above idle! Be carefull about this; reinforce with inside metal rings if nessesery. Yes you are right I had the bottom bucket double lined , will need to double line the upper bucket for sure. Where the fitting goes into the bucket I am going to beef it up even more on the outside of the bucket, notice a weak spot there. Thanks for the information on your bucket design. Darned if that doesn’t look good, Bob. Very neat workmanship. Disciplined artist you are. Over the New Year holiday I spent a couple days Snowboarding at Mission Ridge with some friends from the west side of the mountains in the Seattle area. That was after shoveling 2000+ sq.ft. of snow fall twice in one day. A good way to get in shape to go riding. I did get my filter bags finished today. The four bags ended up being 7.8 sq.ft. of filter surface area. 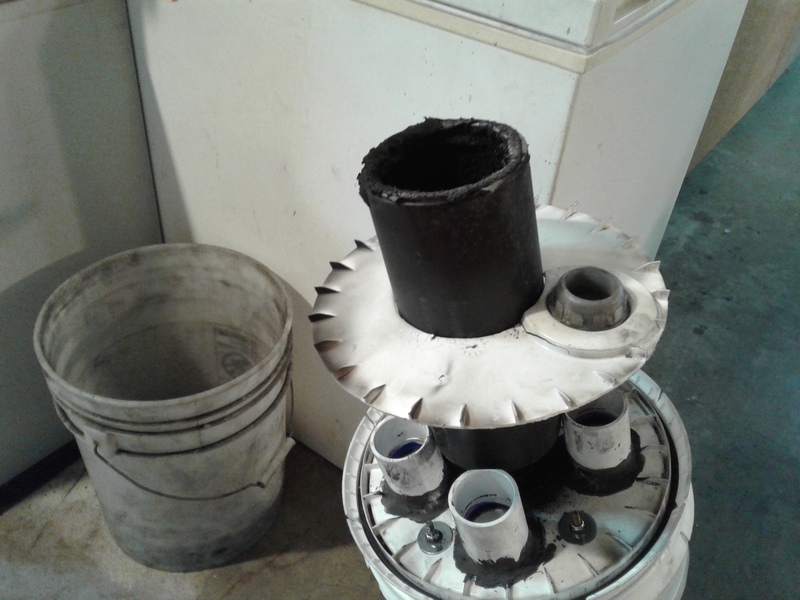 The bottom and top buckets are double lined now, and where the pipe goes into the side of the lower bucket it is tripled lined and sealed. 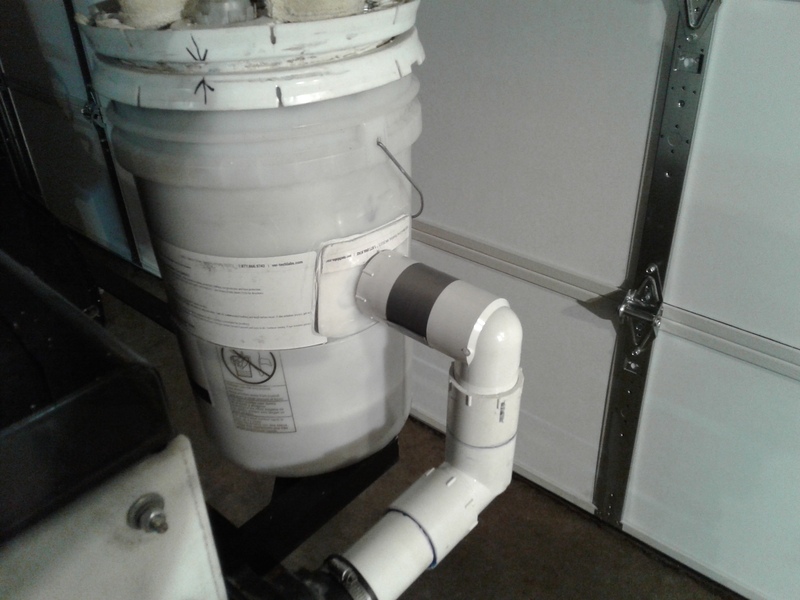 It nice and sturdy now, should not have a problem with the buckets collapsing because of vacuum pressure. I need to finish up on hooking up the clycone and the exhaust piping fitting for the EGR and it will be ready for test run number two. that looks great! I really like your filter bags. Made from a towel? So now everything is ready for the road-test? Yes Til, using Kristijan’s type filtering bags. Ha I would love to put on the Subaru Outback that it was planned for, but my lovely Dana gave her Subaru to the daughter to drive and started to drive my car. She loves it and will not give it back. Looking for another Subaru to use now. Might hook it up to the Dakota for testing we will see. 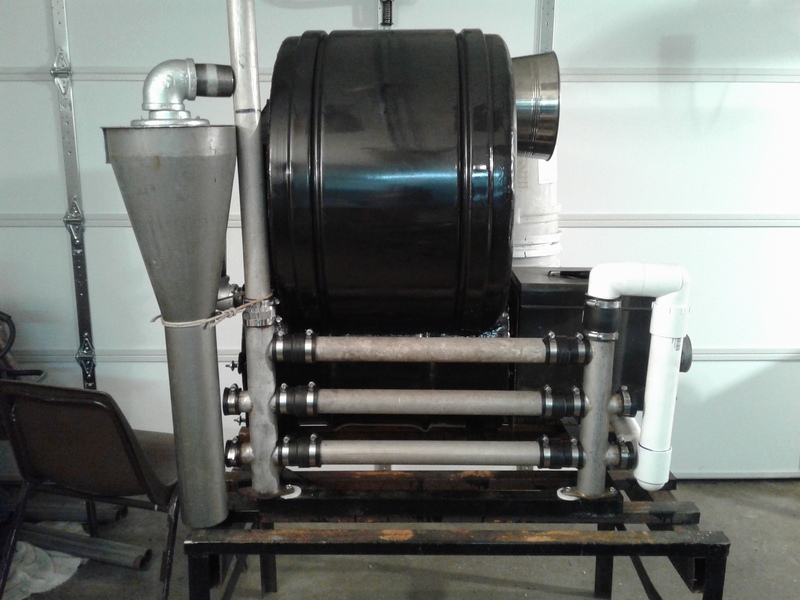 LOOKING GOOD Bob if you ask me it was built by a scientific genious, engineer.That looks like will last good long time for any filter use, i wounder if one like that would work on on wood gas 4Cyl truck after the straw filter. Looks very professional Bob! Can’t wait to see your setup running an engine. Hi Kevin, I’m sure it will run a 318 cu.in. engine just needs more charcoal. I just might slip in the bed of my Dodge Dakota to see what it can do. If I am unable to find the right vehicle. I say go for it, it’s as good a test bed as any, and if you have a tee into your existing system somewhere it will allow a quick swap out for any reason if ever needed. Also, what better opportunity to do a straight up performance comparison on two systems than that? Establish good baseline info on the wood system and then it’s practically scientific. 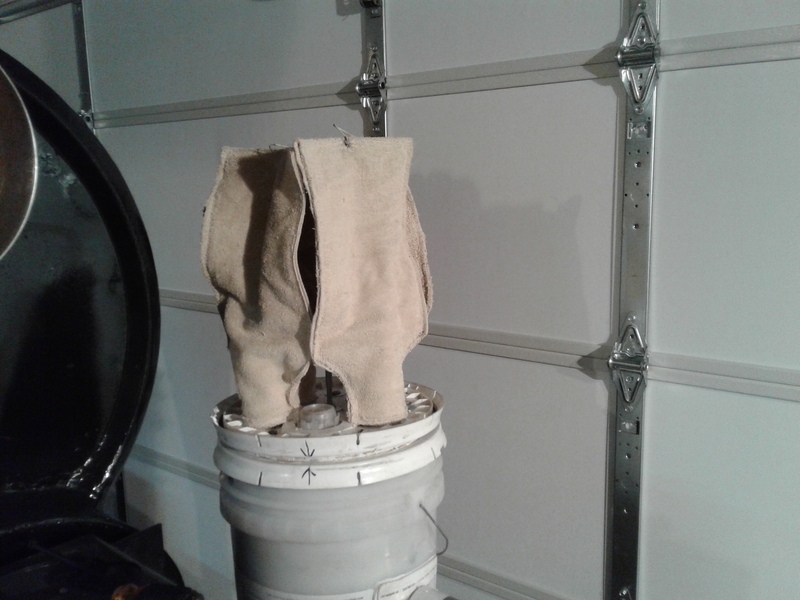 The plan was to fire up the Charcoal Gasifier today and see how it will run a flare. It is raining right now and freezing to the ground. So here is a walk around of the unit instead. Thank you Bob for a nice walkaround! A butyfull proffesional system! Cant wait to see it run a engine! Tha hopper is big! How much char does it take?